The Bridge House is a 20-bed homeless shelter in Plymouth, NH, serving some of New Hampshire’s most challenging individuals, including families, the elderly and veterans. Children whose families are at The Bridge House interact with other families, go to school each day and thrive in local schools, partly due to a “no TV or video game policy.” Veterans work with case advocates to find solutions to life’s daily issues and set appropriate goals for finding jobs and attaining permanent housing. The Bridge House receives about one third of its funding from state and federal sources and the remainder from philanthropic efforts. As state and federal funding decreases, it’s more and more difficult to keep the operation afloat. Cathy Bentwood, Executive Director, long dreamed of opening some type of social enterprise which would provide a sustainable funding source for the future. She engaged an interested, potential foundation funder and needed a well-defined opportunity along with a carefully crafted business plan to forecast profitability and provide a roadmap for success for the venture. After a feasibility study that explored multiple options for a social enterprise, Cathy and the Bridge House board decided to go forward with a business plan to explore the feasibility of a thrift store. The Post Group researched competitive and comparable stores in New Hampshire, the local Plymouth market, inventory issues, marketing strategy and operations. From that, we developed three-year financials, including revenue and expense forecasts, summary of cash flow and estimate of required investment. The Bridge House goal is to earn $50K per year and the business plan forecast startup costs required to get to that run rate. This plan was submitted as a grant request to Tashia and John Morgridge’s family foundation, the TOSA Foundation, and The Bridge House received its full request of $116K for startup costs. The Post Group created a plan that works as a comprehensive, step by step template for the shop’s success. Mark and Lynn Post over-deliver, making a great team. Easy to access, available to problem solve, and a pleasure to work with. 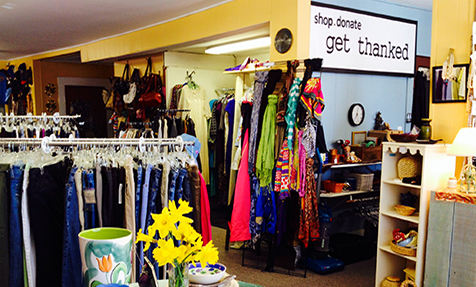 The Bridge House hired a manager and opened the thrift store in April, 2014. Sales are running over twice that of forecasted revenue, donations are plentiful and the store has become a fixture in the Plymouth community. The Post Group enjoys helping nonprofits build their capacity in ways that can help them succeed. Since the business plan project, The Bridge House has engaged The Post Group to restructure their QuickBooks implementation for better financial transparency and redesign The Bridge House website to attract donors and provide information for potential participants.